Through modern eyes, most American cuisine in the 1950s may not seem like the most appetizing stuff. There was an abundance of strange meats, way too much jello, and hot dogs in just about everything (and vice versa). Sometimes the combination of the three made for a fascinatingly grotesque display. But while some of the food in 1950s cookbooks may look a little weird to those of us in the year 2013, as an inverse of the old joke goes, at least there were large portions. America's postwar economic boom created an environment where food abundance was the norm. For decades, the concern had been about trying to produce enough food so that every American could have plenty to eat. Finally — at least in the United States — food insecurity was no longer an overwhelming concern for the majority of the population. As Warren Belasco points out in his 2006 book, Meals to Come: A History of the Future of Food, by 1950 farmers were growing 50 percent more wheat per acre than they had in 1925. The American farmer of 1950 also grew 75 percent more potatoes per acre than his counterpart just 25 years earlier. And supermarkets exploded in numbers around the country. While there were just 10,000 supermarkets in the U.S. in 1946, there were 17,000 by 1953. 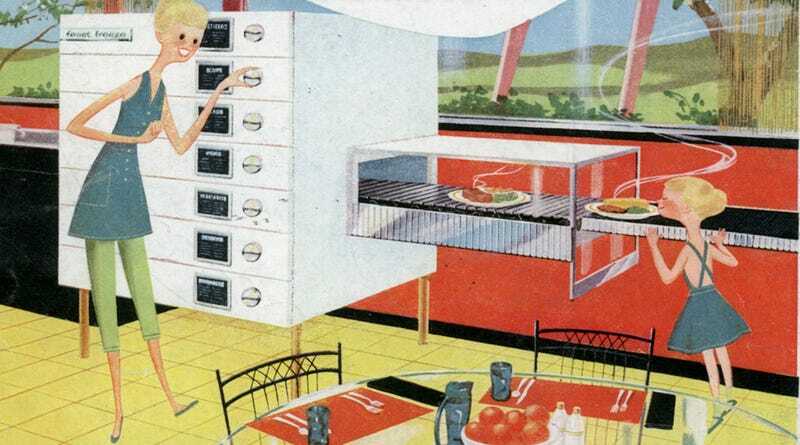 If things were so good and Americans were generally able to get enough calories, then what did the future hold for the techno-utopians who spent all day dreaming about the kitchen of tomorrow? The answer was convenience. In the mid-1950s, the promise of our food future was the push button. The microwave oven was still decades away from becoming a mainstream reality in the American kitchen. But soon — very soon — all your food would be cooked automatically in just a matter of seconds! Pick your favorite foods! Then this imaginary SUPER CHEF assembles your choice from a vast freezer storage, cooks it to perfection by infra-red ray and serves it by conveyor in a matter of seconds! The September 1955 issue of Scientific American included an advertisement for New Departure ball bearings which promised that the "Super Chef" was on its way by 1965. Just push a button, and everything would materialize without anyone having to lift a second finger. Last month we looked at another ad from this same campaign which imagined the food truck of the future. Hot and fresh baked bread in just 9 seconds flat? It was coming soon, thanks to New Departure ball bearings. But the super chef brought convenience into the home. Different freezer shelves held different meals, all ready for Mom to dial up by the mid-1960s. Set the table . . . then set the dial! Future meals could be as easy as that with this miracle meal-getter. And, maybe tomorrow it will be a reality. When it is, New Departure will play an important part, just as it does in so many of today's work-savers. For example, you'll find New Departure ball bearings in almost every major appliance . . . and for good reason. They keep moving parts functioning smoothly, while requiring virtually no maintenance. They support loads from any direction . . . keep parts always in perfect alignment. If you're dreaming up tomorrow's time-saver, or improving your present product, call on New Departure for the most dependable ball bearings in the world. This food cooking system of the future would still be a promise of the future by its projected date of 1965. In fact, it was still a promise of the future in 1967, when Philco-Ford produced a short film showing the home of the year 1999. The scene they set was identical to this ad, right down to the conveyor belt and Mom pushing a button to make everything happen automatically! The main difference? By 1967, they saw the role of the home computer in helping to plan meals. Today, as ubiquitous as they are, the microwaved meal is no longer in fashion. The slow food movement reigns supreme here in the early 21st century. But if we've learned anything from the ebb and flow of 20th century food trends, the slow foodists won't be holding sway forever. One day soon, efficiency will almost certainly become the fashionable priority for Americans yet again. And when that day comes, we might all be enjoying a piping hot wiener straight from our 3D printers. Top image: The September 1955 issue of Scientific American via the excellent Modern Mechanix blog. Bottom image: Screenshot from the 1967 film, 1999 A.D.